Spalting is a by-product of the rotting process that is carried out by a vast array of stain, mold and decay fungi, that are found naturally on the forest floor. When the temperature and humidity are right, spalting can cause many different and beautiful patterns in rotting wood. The unusual colouration may be due to chemically induced reactions between the wood, fungi and insect deposits, often resulting in black, pink, grey and multicoloured streaked wood. It is decorative and can be greatly valued over the uninfected wood. Lighter coloured woods like birch and maple offer the best canvas for dramatic spalting. Once the wood has been cut and kiln dried, the fungi can no longer grow, and the spalting process will stop. Airflow, wood moisture content above 25% and air temperature between 60 and 80 degrees F. are all necessary for spalting. It can be very easy to very difficult to work with, depending on whether you "caught" the wood before it became too punky. Some severly spalted wood can tend to crumble. These areas can be saturated with liquid harderners (like cyanoacrylate glue), or small soft spots can be coated with a coat or two of clear shellac or sanding sealer, just be sure it will not affect any future finishing plans you may have. 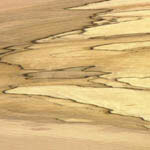 Spalted wood can have a tendency to splotch on finishing so often woodworkers use clear, dewaxed shellac as a sealer. Almost any finish can be applied as a topcoat over this once it's been sanded. If you have had to use hardeners, you'll find that oil finishes and stains do not absorb into the wood so you'll be limited to lacquer style topcoats. Most hardeners will darken the wood as well, so keep that in mind. Spalted wood may still contain spores, therefore it should always be worked and sanded only when wearing a good dust mask or respirator, and using a dust collector. There is medical evidence that substances from decaying wood are a health threat and some allergic reactions and serious lung diseases have been traced to spores and fungi that inhabit rotting wood. The effect on an individual woodworker however depends on his/her natural tolerance to the spores and fungi, since some individuals are more likely to react to environmental toxins than others. The woodworker should be careful in selecting the species used for making kitchen utensils, food storage containers or toys an infant might chew on, since heat, moisture and time stimulate the release of the toxins found in some of these types of wood. Always error on the side of caution and WEAR a dustmask! !